Yes indeed we do deliver throughout New Zealand. 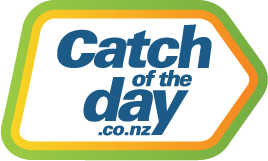 Pricing on the catchoftheday.co.nz website are all calculated in New Zealand dollars so there's no need to work out different currencies. By all means, browse through the site that became one of Australia's top sites for online shopping. Once you have created an account, added items to your cart, you are then given the associated shipping costs. Once the order is placed, you can get on with the rest of your day(or night!). Depending on your location in New Zealand, delivery can be anywhere up to 7 - 10 days. Again, whether it be Te Kauwhata, Christchurch, Auckland or Hokitika, you can rest in the knowledge that your order will be delivered to you. Chat online: For a fast response, click on the Live Chat icon located below when our team is online. Online Form: Click on "Submit your request" below this article and follow the instructions. Our Team aims to respond within 2 business days.